Because so few consumers have ever visited a dairy farm, our dairy farmers get a lot of questions about the cows, milk safety, and how milk gets from the farm to the refrigerator. Dairy farmers take great pride in caring for their cows and keeping them healthy and comfortable. Cows have four stomachs. Technically, cows only have one stomach, but it has four distinct compartments. It is very different than a human stomach, so that’s why people often say cows have four stomachs. The first three compartments process feed in a way that people cannot. Due to this unique digestive system, cows have the ability to convert plants humans can’t eat into nutritious milk. A cow that is milking eats about 100 pounds of feed each day. The feed is typically a combination of grass, grain, and a mixture of other ingredients like citrus pulp, almond hulls and cottonseeds. These are items that may otherwise be thrown away. We like to think of cows as the ultimate recyclers. The ingredients that we can’t eat can often be nutritious for them. Farmers employ professional animal nutritionists to develop scientifically formulated, balanced, and nutritious diets for their cows. A cow that is milking drinks about 30 to 50 gallons of water each day. That’s enough water to fill a bathtub. During periods of heat stress, water intake may double. Water weighs 8.35 pounds per gallon, so a milking dairy cow may consume as much as 420 (or more) pounds of water daily. 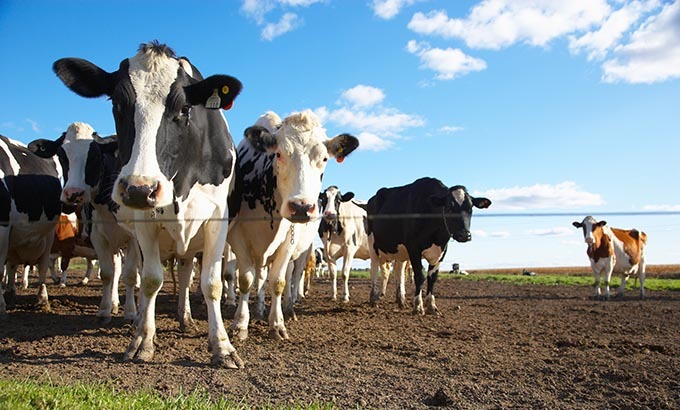 An average Holstein dairy cow weighs about 1,500 pounds. That’s nearly one ton. A cow’s size depends on a variety of factors like age, breed, feeding, genetic potential, and other factors. A cow’s weight can vary between 1,000 and 1,800 pounds. An average dairy cow produces 7 to 9 gallons of milk a day. That’s about 128 glasses of great-tasting, nutrient-packed goodness. Cows like it cool. Due to their thick skin, hair and natural insulation, dairy cows prefer temperatures between 40˚ and 65˚F. Farmers in colder climates have several ways to take care of their cows in the winter, such as closing the barn doors or hanging plastic curtains over the open sides of the barn. During the summer, farmers keep their cows cool by turning on their barns’ fans and water misters.